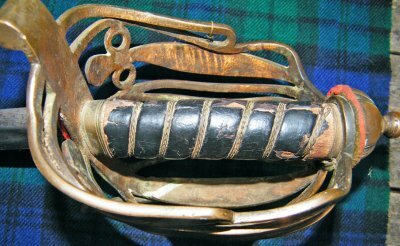 A very rare Napoleonic War's British highland infantry sergeant's broadsword. 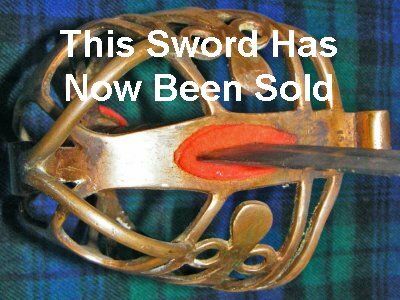 Please also see my listing for an equally rare officer's sword of the ame pattern; 1798P Rare Napoleonic Scottish Highland Infantry Officer's Broadsword by Woolley. This is such a rare sword. The Napoleon Wars sergeants broadsword had an extreme service life and the hilt is brass, so much weaker than steel. As such, most of these swords are in pretty bad shape (broken hilts, etc.) when they come onto the market. This is an exception, the hilt is in very good order, as is the 83.5 cm blade. 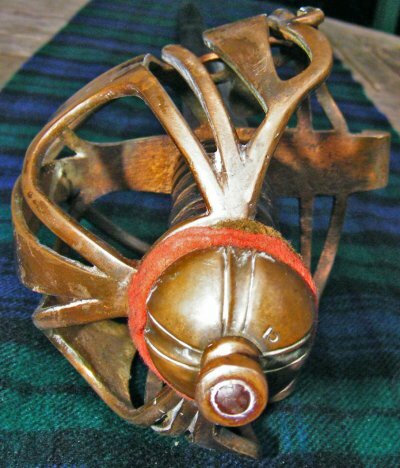 You can tell it is a sergeant's version by the plain blade, leather grip (this one is very aged / worn but incredibly still has its wire bindings intact) and regimental stamps to the hilt. Here we find "CI" and "I5". Because markings were not standardized at this time, being left to the whims of the regiments who bought them, I can only speculate these likely mean Cameron Infantry and Infantry (sergeant's sword number) 5. If I am right, it was at the Battle of Waterloo. If you can find proof of what I speculate, this sword would be worth three times the price I am asking for it. You will be very fortunate indeed to ever come across one of these in such good condition and at this price in the future. Item reference number 553 (NZ2). Further / larger images available upon request.